This easy fettuccine with scallops recipe is tossed with lemon cream sauce. Perfect for a no-fail romantic dinner or an impressive dinner party. 1. Bring a large pot of water to a vigorous boil. 2. While the water comes to a boil, pat the scallops thoroughly dry with paper towels. If the scallops have a tough little rectangular portion on the side that’s uncharacteristically dense and hard, trim and discard it. 3. Heat 1 tablespoon oil in a sauté pan over medium-high heat. Let the oil get very hot but not smoking. Add the scallops and sear on both sides, turning once, until almost cooked through. Remove the scallops from the skillet but keep the skillet on the stove. 4. Turn the heat beneath the skillet down to medium-low and add the remaining 2 tablespoons oil to the pan along with the minced shallots. Cook, stirring, until the shallots are softened and tender but do not let them brown, 2 to 4 minutes. Add the cream and, stirring constantly, bring it to a gentle simmer. (If your pasta is still a while from being done, remove the skillet from the heat, cover to keep warm, and then return to a gentle simmer before proceeding.) Add the lemon zest, lemon juice, chervil, and, if you feel it’s necessary, a very small ladleful of pasta water to the sauce and cook just until the sauce thickens, anywhere from 1 to 4 minutes. 5. Meanwhile, add the pasta and plenty of salt to the boiling water and cook until al dente. Drain the pasta and return it to the pot. Add the cream sauce and scallops and toss gently to combine. Season with salt and pepper to taste and pile onto plates. 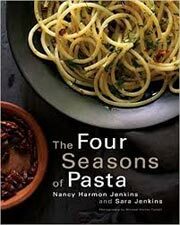 Fettuccine with Scallops Recipe © 2015 Nancy Harmon and Sara Jenkins. Photo © 2015 Michael Harlan Turkell. All rights reserved. All recipes and photos used with permission of the publisher. Gorgeous. What a simple yet special pasta that would be perfect for lunch, brunch, or dinner. I actually made this for a midnight supper and it was perfect—not too heavy but still very cozy. Prep took a mere 10 minutes to chop, juice, and dry a few ingredients. I used fresh pasta for this dish, and I'm so glad I did. (For the record, I never use fresh pasta, but I wanted to make this dinner stand out.) The fresh pasta really caught all the sauce, nothing was going to waste at the bottom of the serving bowl. I bought some beautiful scallops at the farmers' market and did not need to trim them. I sautéed the shallots for about 3 minutes, and once all the ingredients were added, the sauce took 3 to 4 minutes to thicken. Serves 3 (or, if ravenous, 2). I just had to make this recipe. The ingredients are all things I adore. When I couldn't find bay scallops, I was actually pleased. (Don't tell anyone.) For me, they just don't compare to sea scallops. I love a perfectly pan-seared scallop. The lovely golden brown crust, the inside tender and moist—sublime! This is definitely going to be a go-to recipe in my arsenal. It's so quick to throw together and very elegant. A treat for yourself. A treat for yourself and someone special. It would also be something nice to serve to company. You would just need to adjust the proportions, which is easy to do. Note: The key to a perfectly seared scallop is to make sure that you wipe off all of the extra moisture from the scallops. I dry mine with multiple layers of paper towels. My scallops were seared beautifully in 2 1/2 minutes on the first side and 2 minutes on the second side in a cast-iron skillet. I used a good imported dried pasta from Italy. We enjoyed this with Champagne. Or I should say, we enjoyed Champagne with this. Oh, what a decadent and delightful pasta this is! Seared scallops on their own are an elegant treat, but when tossed with tender pasta coated in a creamy lemon sauce, talk about incredible! I found some lovely sea scallops at the market, so I splurged and topped each bowl of pasta with 4 jumbo sea scallops instead of the bay scallops. One pound of pasta made 4 servings. I used fresh fettuccine, and it was very tender and a lovely match for the creamy sauce and sweet scallops. (Yes, I did trim the hinge part off of some of the scallops; not all of them had it.) I seared the scallops for 1 1/2 minutes per side, and they were perfectly cooked. I used fresh parsley from the garden instead of chervil. In step 5, once I added the lemon zest, juice, parsley, and pasta water, I only cooked the sauce for a minute more. It was just thick enough and lovely when tossed with the pasta. Such a wonderful and simple recipe! I would call this a solid recipe. Most of the ingredients are in my pantry or fridge. As the pasta cooked, I patted the scallops with a paper towel. They were very thick, so I cut them in half horizontally. I seared them but noticed they bowed a little on one side so pressed them with the spatula to be sure they browned. It didn’t take long for them to cook, maybe 1 1/2 to 2 minutes. I removed them from the pan and tented them on a plate. Following the recipe, I turned down the heat and added the shallots. The pan was still too hot, and they didn’t just soften, they browned within 60 seconds or so. I turned it down quickly but oops. I removed the pan from the stove surface when I added the cream. I was a little concerned about the cream curdling. I added the pasta first to the sauce and mixed it well. It was a great bonus to have the lovely seared scallops create some great juice while tented. I scraped it all into the pasta and mixed. The end result was a delicate, lemony, creamy, slight sweet, shallot-flavored pasta topped with scallops. This was an easy, quick, and very good recipe. Try it! This is a very satisfying pasta dish. Think shrimp scampi minus the garlic, and bay scallops instead of the shrimp. That said, this dish would be wonderful with shrimp as well, although the time to sauté the shrimp would be more than the 3 minutes it took to sauté the bay scallops. This is a great weeknight meal—it can be made from start to finish in less than 30 minutes. Be sure to remove the little side muscle from the raw scallops. It's a slightly different color and runs counter to the grain of the scallop itself, so it's pretty easy to identify. It's tougher than the rest of the scallop and removing it makes the scallop more tender. I used dried linguine, which worked very well. 1/2 pound will serve 2 as a main course or 3 as a starter course. I didn't have to set the cream sauce aside while waiting for the pasta since the pasta was perfectly al dente in 10 minutes, which was the amount of time it took to cook the scallops and make the sauce. I always like to add the cooked pasta to the sauce pan and cook it in the sauce for a minute or so. Be sure to use plenty of pasta water to create a nice loose sauce (up to 1 cup or so; use your judgment.) I started adding the pasta water after the shallots cooked for about a minute to prevent them from over-browning. The liquid will also help to deglaze the pan and get those flavorful brown bits stuck to the bottom of the pan into the sauce. This was a beautiful meal in both taste and presentation. I think the results will vary based on the quality of scallops and pasta used. I had only frozen scallops available to me, and they released quite a bit of liquid when cooking despite being patted dry, which resulted in less of a crispy sear on the outside than I'd hoped. After they were cooked through, I removed the scallops and 1 teaspoon of the liquid and poured out the rest before moving on to the shallots. I topped the pasta with all the cooked scallops and the remaining liquid before putting the sauce on. The scallops were still flavorful, and the bright notes of lemon in the sauce really made them shine. I also made fresh fettuccine, and the sauce, which had a lovely texture, clung beautifully to the strands of pasta, and there was hardly any left pooled at the bottom of the dish. My only change would've been to add a bit more cream to the sauce. Ayrton! So glad to hear it. Marcella, many kind thanks! You are of course sooooo right. Tweaked the recipe above accordingly so there will be no fresh pasta mishaps. Greatly appreciate it!